I'm pretty new to gardening and landscaping. Having recently bought a house, one of the things I'd like to be able to do is identify the trees and smaller plants that are on the property so I can learn how to take proper care of them. Rather than post a bunch of pictures here, how do you go about identifying unknown plants and trees? Are there resources (online and free are a bonus!) that you go to? Colby College. World Wide Flowering Plant Family Identification. Botanic gardens usually have a free plant identification service. Plant nurseries are usually helpful, but remember they are businesses, so if you want to continue getting advice long term it's a good idea to buy something from them occasionally. Google image search lets you drag and drop an image into the search box. After you drop the image, Google shows you a handful of similar images, then lets you enter a description to weed out irrelevant matches. Web Weed Lookup is handy for identifying weeds. You still have to compare the plant to the photos. If you suspect something is a weed you can take it in to the council and they will send it off for identification. The Department of Primary Industries (e.g. Qld DPI) have information about pest weeds, but it isn't always easy to find. Weeds in Australia has a weed identification tool where you enter the weed type, flower colour, and state. 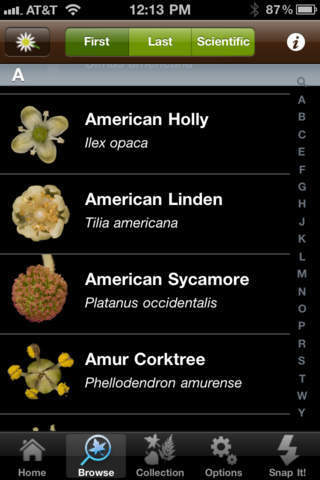 Leafsnap is an iPhone and iPad app which will identify trees based on photographs of their leaves, bark or flowers. Obviously this won't help with the other plants you need to identify, but it should help with the trees. At the moment they only have the trees found in a few states in the US in the database, but they are hoping to extend it soon. 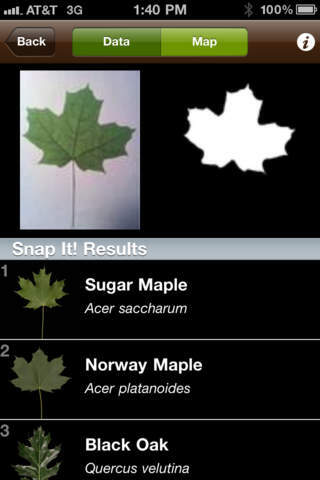 The Leafsnap UK iPhone app includes trees from the United Kingdom. The main problem with searching via picture or description is the amount of time that you'll spend examining each result trying to locate your plant. There's no "Google for plants" (yet), so the amount of time it'll take you to find what you're looking for is probably going to be tremendous. Your local nursery (or possibly a university) is going to be your best resource. You can take a picture or even a sample of a plant with you and someone who's familiar with your local foliage should be able to recognize what you have. Talk to your neighbours, especially those that appear to like gardening. I'm constantly amazed (in a very good way) how knowledgeable and happy to help "gardening" neighbours can be. Get to know the people working at local places like, gardening nurseries, feed mills, etc, you can normally bring them samples or photos for identification & guidance. I have found it's best to also buy stuff from them, not necessarily every visit, but you don't want to became that person who only visits when they need information. Most areas have local gardening clubs, associations, get to know them and the events they put on. If you live in the USA make good use of your Local Extension Office. Your nearest Botanical Gardens is also a great resource. Some offer "Horticultural Gardening Answer Service" (by phone) and/or walk in. Online services, but I've personally found for plant identification they can be a bit "hit or miss", mainly due to those services being unable to physically see the plant. Do you have something on your site, or a resource you "generally" point people to, who wish to identify plants in AZ? @dbgtweet reply - Yes we do: Desert Landscape Gardening Help has information and links to other useful websites. My follow up question to above response - Do you also have a browseable database (with photos) of plants for AZ that the public can access/use? @dbgtweet reply - Not at this time. Perhaps the easiest way to identify them is to take samples of the leaves/fruits/flowers to your local gardening center. They should be able to identify it for you. If not, you can go to your town botanist (if there's one). You can also post a question on this site (see these questions for examples on how to post such questions) and tag it identification. At minimum, it should have a clear title that describes the plant, a good picture of the leaves, flowers/fruits and perhaps the entire plant and most importantly, it should also indicate where you are located as that greatly aids in identification. Sometimes, a picture of the root may be necessary and you'll be asked for it. Identifying over the internet may not be as precise as contacting an experienced person (especially because one cannot smell the plant). However, the number of correct identifications on this site has been pretty high. I was trying to identify a common shady non-native trees in the Adelaide parklands for ages, but found help at What Tree Is It where you can drill-down to more and more specific groupings by leaf or by fruit, using the pictures and descriptions provided at each fork. Unfortunately the database isn't exhaustive and they didn't have my tree there (super common Ulmus glabra) but should be helpful in North America, where its targeted. Plant identification IS tough! What you have to remember is to not get overwhelmed, learn the botanical names, not common names. The plant world is a whole new language...in college they have big classes that teach you how to use a plant key...a big thick book pertinent to whatever area you live. Plant Key to the Pacific Northwest for example. To be able to use this key you will have to understand a lot of plant terminology. I took this class and was very humbled. We were given frozen 'flowers' to id the plant. Almost all of our work was done on microscopes! Is this plant a monocot or a dicot? One cotyledon or two? You answer the question and then there will be another question...like, are the leaves alternate or opposite? Only one answer is correct. If you answer a question wrong, you'll find yourself wondering where you went wrong...great way to learn about plants if you don't get frustrated so badly you throw the book away. Take pictures and attach samples of buds, leaves, bark, flowers whatever you are able to get from your plants. Ziplocs with samples and picture (s) of the plant stapled to the ziploc. Do just a few plants at a time if you are new to gardens and plants. Armed with 2 or 3 different plant samples with attached pictures. As many of the others have said, take to your favorite (closest) nursery. Talk to a number of the employees, having real experience and/or knowledge. Get at least 2 or 3 responses to match up, then look up for yourself. Get to know your plants, including their botanical names (Genus, species...varieties). Some nurseries, I know the ones that I worked for, will love to help you figure out your landscape inhabitants. Not all employees of nurseries will know enough to help you. Private Ma 'n Pa nurseries would be my preference. The bigger corporations don't care about your problems. Ma 'n Pa have to work harder to make a living competing against the corporations and welcome a way to earn your trust. While you are trying to learn the names of your plants I highly recommend doing a scale drawing of YOUR landscape as is. Get utilities in there (look for your 'as-built' that should be with your mortgage documents), wind, sun exposure, hardscapes (concrete, pavers, gravel, pergolas, arbors, sheds), water sources...lots of highly trained and knowledgeable plant people are now finding themselves watering plants at nurseries...GRIN! And would love to pass on knowledge just because...you just have to visit them and ask . You'll find a place where you'll trust their knowledge and merchandise. Make them earn their money...and always question the information you are given. Take notes. Go back home, get on the internet and make sure you understand what you have learned. Learning the LANGUAGE of plants opens a huge, exciting world to you...until we 'own' a landscape very few people find the time or inclination to learn about plants, soils, geology. If you think you'd like to be a gardener, consider a virtually free class called 'Master Gardeners'...run by a University/College Cooperative Extension Service. Now it is done via internet but you meet once per week with other gardener wannabes for a couple of months. You learn all the basics very quickly, lots of field trips and are forced to talk the language right away. You make friends, network and learn this stuff quickly!!! Once you learn 'the name' of a plant your journey has begun. Learn the botanical...scientific names. Common names are a disaster. Just the name of a plant, not knowing another thing about the plant, will mean a lot. Spelling is far more important than the correct pronunciation. Put your pics up on this site...I am new to the StackExchange but i am very impressed by their format and how they cultivate incredible minds/professional advice here...very impressed. The more you know in this field the more you see you don't know. The only way to be a gardener is to start asking questions, and know you'll never know everything. But being a gardener is worth every minute you spend learning the language...truly! How do I go about identifying all the plants in my backyard? Does anyone know of a somewhat comprehensive plant database available online? What is this tropical-style houseplant? What are these tall, tree-like shrubs and how often should I water them? Please help identify this aggressive vine?